Thank you to everyone who has already submitted comments to the FDA about genetically engineered (GE) salmon! The outcry has been loud enough that agency has extended the deadline for public comments an additional 60 days. Now we need to increase the pressure so that the approval isn’t just delayed, but stopped! We now have until April 26, 2013 to submit comments to the FDA asking them to stop their mad rush to put GE salmon on our plates! The GE salmon has been genetically altered to produce extra growth hormones, allowing it to grow faster and bigger than natural salmon. There are no independent studies on the salmon’s safety. 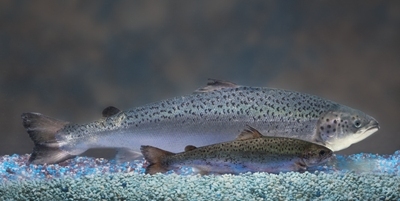 FDA instead relied on the false assumption that GE foods are “equivalent” to natural foods, as well as data provided by the company that created, and stands to profit from, the GE salmon. At the same time, FDA ignored the concerns raised by thousands of Americans and dozens of legislators and scientists, including the National Oceanic and Atmospheric Administration (NOAA) and the U.S. Fish and Wildlife Service. Since it will not be labeled, people will have no way of choosing to avoid GE salmon in the stores if this fish is approved. In addition, the GE salmon poses a threat to those who wish to eat wild salmon or other seafood. If the GE salmon escape from the fish farms, which is all too likely, they could devastate native salmon populations, as well as the fish and marine mammals that depend on salmon for their food. Scientists have predicted that escaped GE salmon would likely wipe out wild salmon populations, which will destroy the livelihood of coastal communities that depend on fishing. Yet again, the Administration is willing to gamble with our health for the financial benefit of one biotechnology company. US citizens have the opportunity to comment to the FDA, expressing their opposition to genetically engineered salmon. Please speak up now! Please submit your comments to the FDA, urging it to halt approval of the GE salmon. Comments must be received by the FDA no later than April 26, 2013. There is a time limit on the government’s online system. We encourage you to write your comments and save them in a document on your computer, then copy and paste them into the online comment form or upload the file. Remember to hit “submit comment” when you are done. BY MAIL: Division of Dockets Management (HFA- 305), Food and Drug Administration, 5630 Fishers Lane, rm. 1061, Rockville, MD 20852. Include the following docket number in your mailed comment: FDA-2011-N-0899. Please personalize these comments! Include a personal statement about who you are or why you care about this issue at the beginning of your comments so that it’s not just a form letter. The personalization can be just a few sentences, but it does make a significant difference. I am writing to urge you not to approve genetically engineered (GE) salmon. The agency’s draft assessment does not adequately examine the risks posed by the first genetically engineered food animal, both to people and our environment. First, the draft assessment does not adequately address the many potential food safety risks posed by GE salmon. There are potential human health impacts from both the increased levels of hormones and the increased allergenicity. The agency should not approve a genetically engineered food animal for commercial production and sale without independent, long-term studies on its health effects on people. Second, the draft assessment also fails to adequately address the major environmental impacts of GE salmon. The agency assumed that the GE salmon would only be raised in the type of facility specified in the company’s application. But once approved, it is very likely that GE salmon will be raised in other, less secure, types of facilities, such as open net pens in the ocean. The persistent problem of escaped fish and the spread of diseases from commercial salmon farms where this GE salmon could one day be produced must be evaluated before approval. I urge you to put human health, the environment, and the economic well-being of coastal fishing communities first. Please delay approval of genetically engineered salmon until the results of independent scientific studies show that genetically engineered fish is safe to eat and harmless to the environment. Please also require the labeling of GE foods, to allow consumers to make an informed choice. If you would like to do more, please contact your legislators, asking them to block the approval of GE salmon.